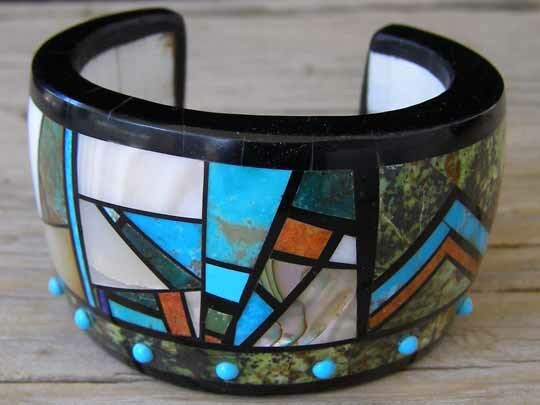 Christopher Nieto Mosaic Inlay Bracelet size 5 3/4"
This mosaic inlay is done on a foundation of conus shell. In terms of technique, the special thing about this bracelet (and what makes it so difficult to make) is that the tiles must be carefully carved with a curvature on the under side so that they fit to the curve of the foundation shell with no play, no give. Like so many things, it's what you don't see that makes what you do see so special. From the curved surface to the smoothly-jointed binding tiles which form the edges of the bracelet, this is painstakingly detailed work which requires extreme patience and expert skills. The conus shell forms as a spiral, so the inside circumference is smaller at one edge of the bracelet than at the other edge. This works perfectly, because as the arm thickens with muscle moving towards the elbow, this perfectly accomodates the change in circumference. The size quoted here to describe the bracelet is the smallest measurement around the inside on one of the edges. That is the size to pay attention to. If you wear a size 5 3/4" bracelet because that is the measuremnt of the circumference of your wrist, then this is the size for you. Please read further sizing information listed below. This is a very special bracelet. It is made for a collector. It is not for daily wear through the thick and thin of life. You can't get under your car and change the oil and knock this against metal and concrete. Use the Mink Coat Rule on this one (even if you would never wear a fur coat): Don't wear it to garden or play football, don't wear it swimming or in the shower and stay out of barroom brawls (at least when wearing this). Places you might wear this? Dinner at Gallatoire's when you're in New Orleans for the Jazz Fest, while sipping a fine single malt at the Top of the Mark in San Francisco, when giving your Nobel acceptance speech in Stockholm (regardless of which prize you won), or at the White House for a State Dinner. You get the drift. ***Special note about sizing: Because there is no flex to this cuff, it must fit you from the outset. This isn't a haphazard process of sizing. Please make sure that you know your size by using a tailor's tape measure to measure your wrist before ordering. This is true to size. For this particular bracelet, your wrist should have a total circumference of 5 5/8" or 5 3/4" in order to properly fit this piece. More about Conus shells: Click on this link to learn more and see a short video clip of a fish-eating conus shell. Etched into the conus shell inside is Chris Nieto and Aug. 2015. Width of cuff: 1 5/8"
Terminal to terminal: 4 1/2"
Total inside circumference (including gap): 5 3/4"